Guns are sensitive things and you must not want to see your child playing with these. Every year hundreds of children get killed because of wrongly stored guns. Apart from this, there is much more reason to store your guns properly. Gun safes are the best way to secure your guns from any kind of unwanted accident. They come with multiple levels of security to ensure the safety of your guns. Besides, they are built with strong and thick materials to provide a heavy resistant against drills and cutting tools during a burglary attack. Nowadays, the majority of the gun safes include biometric access, voice recognition, digital lock combination, etc. advanced feature to provide the highest level of security for your firearms. There are thousands of gun safe models in the market from various manufacturers. As a result, it is a little bit overwhelming to choose the right gun safe according to your preference. We have reviewed some of the best gun safe under 1500 USD as well as provided a gun safe buying guide to make the process easier for you. The price of the gun safes varies on a large scale. Majority of the safes will cost you a good amount of money though not all of them made with concerns about the protection. Some of them even don’t have all the needed security features. It takes a lot of research to find a solid gun safe at an affordable price. According to our research, we have found the following gun safe which comes with a compact built quality along with decent security features. We have provided in-depth reviews about the gun safes in below. Take a while to read the review and you will easily find a suitable safe from the list. Steelwater is one of the most popular names in the history of gun safes. They are enriching the safe market with the quality gun safes in a reasonable price. 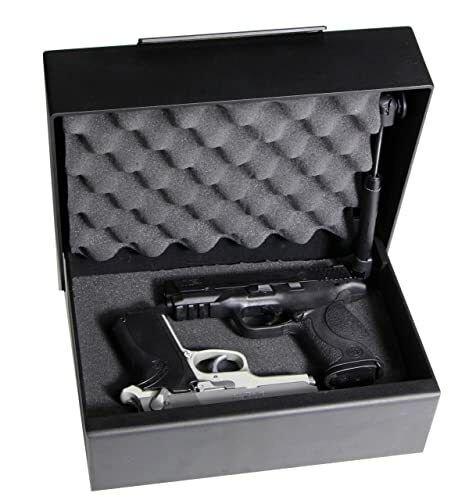 They have a wide variety of gun safes and all the variation comes with quality build and safety features. The Steelwater Standard Duty 16 Long Gun Safe is one of the best and highest rated gun safes from the brand. The gun safe can give you a great protection against fire. It can resist fire up to 60 minutes long without damaging your firearms. 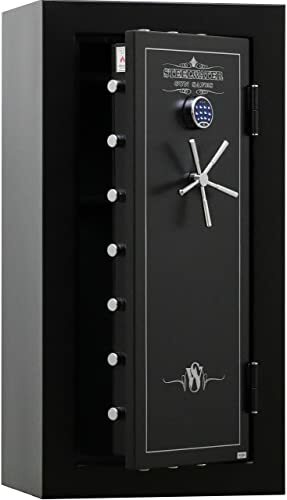 The gun safe is constructed with 14 gauge steel and the door is constructed with 5’’ thick composite constructed door with two layers of fireboard. There are also double fireboards in walls, ceiling, floor, and door jam. The doors seal out smoke and water as well as expand up to 8 times its thickness in case of flood or fire. Let’s talk about the security features of the Steelwater Standard Duty 16 Long Gun Safe. The gun safe is secured with an EMP proof digital keypad lock key. You will be able to lock and unlock the tool with a 3 to 8 digit code. There are 10 1.5” solid steel locking bolts which add extra strength to secure the safe. Moreover, there are two internal re-lockers which will automatically lock the safe as soon as it detects an attack. The semi-gloss textured finish of the safe will easily blend with the other furniture to beautify your place. The price of the gun safe is extremely low though it comes with a decent construction and all the necessary features. Up to 60 minutes fire protection at 1875 degree. 2x fireboards in the door for additional security. Easy to use EMP proof digital keypad lock. 10 1.5” solid steel locking bolts with the direct drive mechanism. Keep the smoke and fire out with expandable door seal. Perfect choice as an entry level gun safe. The walls are not so thick. V-Line is popular for manufacturing high-quality gun safes with super tough construction. The V-Line Brute Heavy Duty Safe is a little bit different from the other gun safes we mentioned in the article. It comes in a compact size and it couldn’t store big guns. If you are looking for a secure storage for your pistols than the V-Line Brute Heavy Duty Safe can be a great choice for you. The safe constructed with rugged 10 gauge thick steel when an average gun safe is made out 16 gauge steel. The thick constructions along with black textured powder coating finish not only ensure the security but also ensure the durability of the safe. The design of the safe is extremely good and you will definitely love it. The V-Line Brute Heavy Duty Gun Safe comes with a simple but effective simplex type digital combination lock. The combination key is reprogrammable with a button situated inside the safe. The same locking mechanism is used by a lot of manufacturer in the market and it is pretty reliable. The gun safe is highly weighed but you will not need to push it for the opening. You can easily open and close it with the help of a gas-powered opening strut feature. There are 4 1/4 inch pre-drilled holes which allow you to mount the gun safe at any surface. If you are looking for a small but high-resistant gun safe then the V-Line Brute Heavy Duty Safe will be the best choice for you. Super tough 10 gauge rugged steel fireproof construction. Clamshell case design to resist pry attacks. Reprogrammable and reliable simplex type combination lock. Easy opening and closing with the gas-powered opening strut. Constructed and manufacturer from the USA with proper quality control. Beautiful and durable tactical black powder coating finish. Highly weighed and no carry handle. Not suitable for larger guns. The Stack-On SS-22-MB-E 22 Gun safe is a great choice in mid-budget considering its large storage compartment. It has enough room to store 22 rifles or shotguns up to 54 inches tall as well the ammo of the gun. The gun safe comes with factory installed shelves and carpets which allow you to store your gun in the safe in an organized way. Stack-On SS-22-MB-E 22 Gun safe comes with a 3-number combination lock along with 2-way locking system. The electronic lock includes an operational light for open, incorrect entry and low battery warning. There is also a backup key in case if you forget the combination or battery died. Behind the digital lock, there are drill-resistant hardened steel plates to resist any attack using drill tools. You can mount the gun safe with any surface using the pre-drilled holes. The Stack-On SS-22-MB-E 22 Gun safe comes with a beautiful black epoxy paint finish with chrome drawls and silk-screen on the door. This safe comes with large concealed hinges and hinges side steel dead bolts for additional security. The concealed hinges are engineered to provide wider access to the stored guns. The safe is neither fireproof nor waterproof. However, with reliable construction and electronic combination lock, it is one of the best gun safe for $500. With entry-level security and no fire and water resistant, the gun safe will be a perfect choice for the gun collectors who are in need of a backup gun safe for the extra guns. Hardened steel plate behind the lock for additional security. Extra-large storage to hold up to 22 guns at a time. 2-way door locking with 1” live-action locking bolts. Pre-drilled holes for easy mounting at any surface. Barrel rest with scope standoff inserts. Beautiful black epoxy paint finishes with chrome accents. Can’t resist against fire and water. The combination can only be changed by a licensed locksmith. The Steelwater Heavy Duty 22 Long Gun Safe is another great product from the brand Steelwater. It comes with a lot of quality features to ensure the highest level of security for your guns. The versatile gun safe comes with a lot of room inside it and also allow you to make interior adjustment as per as your need. The gun safe is constructed with 12 gauge solid steel and the door of the gun safe is constructed with 5 1/8 inches thick steel which includes three layers of fireboard. There are also two layers of fireboard on the walls, floor, door jams, and ceiling. The door of the gun safe is also designed to seal out water and fire and expand up to 8 times its thickness to secure your items. The Steelwater Heavy Duty 22 Long Gun Safe is highly optimized to provide you the best protection for your guns. The main security feature of the gun safe is an EMP proof digital keypad with a double-bitted high-security bypass key. Besides, it has 20 solid locking bolts which secure all four sides of the gun safe to eliminate any vulnerable areas from attacks. There is also an additional relocking bolt which automatically activates as soon as it detects any punch or moves during a burglary attack. Moreover, it also 4 pre-drilled holes reinforced with 1/4″ steel plate to bolt down the safe. With all those security features, all of your guns will be safe in the Steelwater Heavy Duty 22 Long Gun Safe. 60 minutes long fire resistance at 1875˚F. Large gun storage to store up to 22 guns. Easy but effective EMP proof electronic combination key lock. 8X larger drill/ballistic resistant hard plate to protect the electric lock. Heat activated expandable door seal to seal out smoke and water. It can’t store total 22 guns as advertised. The VAULTEK VT20i Biometric Handgun Safe comes with a lot of digital features to keep your guns safe. It is a perfect choice for those who only need to store one or two handguns and often need to travel with them. Through it is a small and portable safe it has enough strength to provide the highest level of security to your guns. It has a biometric scanner which can hold fingerprints for up to 20 different people. This is really a handy feature to allow all the adults of the family accessing the gun whenever needed. There is also a smart app with this app which allows you to lock and unlock the safe as well as check the charge from your smartphone screen. There is also a digital keypad combination lock for ensuring top-level security. 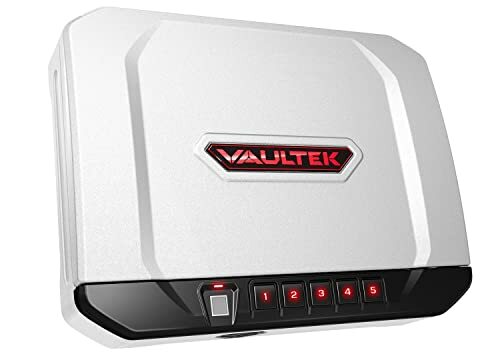 The VAULTEK VT20i Biometric Handgun Safe runs on a rechargeable lithium-ion battery which can provide a four-month large battery backup. There is also a set of laser cut backup keys which allow you to access the gun even if the battery dies. The gun safe is portable but you can also mount it on a safe place for extra security. The body of the gun safe is constructed with 16 gauges heavy-duty carbon steel which makes it almost impossible to break out. The VAULTEK VT20i Biometric Handgun Safe is a perfect choice for the single handgun owners at an affordable price. 16 gauge heavy-duty carbon steel construction. Advanced digital security feature including a fingerprint lock and combination lock. Smartphone app for lock and unlock as well as check the charge and log history. Two physical keys if the user doesn’t want to use the advanced lock features. Additional backup keys to access if the key is forgotten. Mountable at any surface for extra security. The Bluetooth software is not so functional. After reading the above reviews, it should be easier for you to choose the perfect gun safe. All the gun safes mentioned above come with highly protective features and solid constructions. As a result, you can go for any of them based on your budget and preferred size. However, if you are still in confusion and want us to suggest one for your guns than we will recommend you the Steelwater Heavy Duty 22 Long Gun Safe. This is overall the best gun safe under 1500 in our list and perfect for storing a large number of guns at a time. It will provide your guns with the best possible protection in a mid-range budget. However, if you have one or two small handguns that don’t require a lot of room then we will suggest you go for the V-Line Brute Heavy Duty Safe. 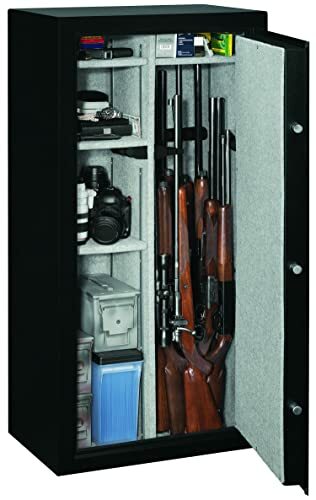 The small-sized compact gun safe is constructed with superior materials and come with all the required security features though available at a cheap price. Considering some factors will help you to buy the right gun safe according to your budget and needs. We have previously mentioned that there is a wide variety of gun safes available in the market. But not all of them are well-constructed and enough strength to secure your guns. That’s why you will require considering the features of the gun safe before buying. Here are some important features that you must consider to be assured about a gun safe. The size of the gun safe is highly important. The gun safe you are going to buy must have enough space to store all of your guns easily. Sometimes, you may want to store other valuable items along with the guns in the safe. A good practice while choosing the gun safe is going for a size which is larger than you need so that you can store more guns or items later if needed. However, you should also consider whether or not you have enough space to place the gun safe in your house. If you have a small space then you will literally need to go for a smaller safe. As like as the other products, the warranty is crucial for the gun safes too. The warranty duration ensures the quality of the gun safe. Most of the gun safe in the market offer warranty for a couple of years and some other offer lifetime warranty. Go for a gun safe which comes with a lifetime warranty. The lifetime warranty not only ensures the durability of the gun safe but also determines the superior built quality of it. Don’t forget to check the warranty policy and whether the manufacturer provides partial for full warranty. The price of gun safes varies on a large scale. It’s true that the gun safes are expensive but if you are smart enough you will able to find a quality safe at a moderate price. As an example, there is some best gun safe under 1500 dollars which comes with decent built-quality as well as strong security features. However, don’t fall for the extremely cheap gun safes, they come with an economical construction and they are very easy to break down. The price of the gun safe also varies on it sizes. You may save some bucks if you go for the accurate size according to the number of your guns instead of the larger size. The overall quality of a gun safe should be accurate. Putting your guns in a cheap quality safe is as like as keeping them in an open space. A gun safe must have solid and quality construction for protecting the guns from any kind of burglary attacks. Gun safes should be made out of 9 to 14 gauge steels and should have enough strength stand up against a drill or pry attack. Besides, it should come with a locking mechanism that works accurately. It should come with several types of lock and the locks should be easy to open for the owners and hard for the others. Nowadays, gun safes offer a lot of quality features which secure the safe much more. Here are some of the features of the gun safe that you should look for before buying it. Fireproofing is a feature that will protect your guns from fire for a specific period of time. Guns are costly things and fire can severely damage them. As a result, the fire protection feature is highly important to consider while buying the gun safe. Go for a gun safe that comes with the fireproofing feature and protect your gun from 30 minutes to 150 minutes. The Biometric access is a specialized locking feature that you will find in very few gun safes. With the feature, you will be able to lock and unlock your gun safe easily with your fingerprint. When the lock is activated none but you can open the safe. This is a recent feature in gun safes and normally found in costly gun safes. Build quality of the gun safe is highly important. When the intruders fail to break the lock they target the inside walls to access the guns. But if the safe is made out of high quality gauged steel, it will become almost impossible for them. The gun safe you choose should be constructed with solid or rugged steel and the door and other sensitive areas should have drill-resistant hard plates in their construction. The size of the gun safe does not always ensure that it will have a lot of room inside for your guns. So before you buy a gun safe make sure how much guns it can store at most. Besides, make sure that gun safe has additional space to store gun components such as ammo and scopes. Don’t rely on a chip thin metal wall of a gun safe as they can easily fail in a drill or pry attack. Go for a well-constructed steel gun safe which has enough thickness to protect your firearms from any kind of attacks. Normally, gun safe walls which are made from 7 to 10 gauge steel are highly strong and provide a solid security.